As hard as it is to believe, summer is nearly over. For many, warm evening strolls will give way to chilly fall evenings on the football field, a sure sign that school is back in session. With the change in season comes a new routine, and this transition requires adjusting our schedules and even the living spaces in our homes. Most find ourselves back inside after months on the patio barbecuing and attending picnics with friends. Preparing school lunches and family dinners kitchen give way to time spent tending the grill. Here are six tips to make your time in the kitchen more efficient and cost effective. Plan a weekly meal menu and shopping list. Take advantage of your local grocery flyers and plan your meals around sale items. You'll have everything on hand to prepare all lunches and dinners, saving you time and money by not making multiple grocery store visits each week. Have a few quick, easy-to-prep meals on hand. Things may come up throughout the week that cut into your meal time. With a couple of pizzas in the freezer or some pasta in the cupboard, you'll be able to whip up a meal in no time. Organize food in your cabinets and cupboards. By keeping similar items together, you can save space and keep food items within close proximity during meal prep. Clean your refrigerator regularly. You'll waste less food and have a better idea as to what you already have available when planning your shopping list each week. Have healthy snacks on hand. These days nearly everyone is on the move and we aren't always able to prepare a full meal. Having healthy snacks on hand can satisfy hunger between meals. Stow tools and utensils efficiently. Use drawer dividers to sort and organize your tools and utensils. You'll spend less time hunting for that pesky can opener when you know it can be in only one place versus three. 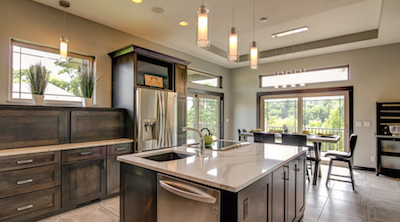 Are you finding that you need more counter or cabinet space as you get back into the kitchen? Or perhaps it's time for a fresh, new look. Be sure to contact Lake Hallie Cabinets for our ideas on remodeling your kitchen. If you have children at home, their schedules also change. Hanging out with friends or working a summer job may give way to school activities and homework. This adjustment can be difficult and convincing them to study in their room instead of being outside can be a challenge. Here are a couple of tips to provide a comfortable and inviting study environment in your home. Have different study spaces available within your home. Consider a combination of a desk, a group of pillows on the floor or a comfy chair. The change of scenery may make it easier to work on different subjects, perhaps math at the desk and reading in a comfy chair. Make their study spaces inviting. Whether in their bedroom or in a common living space, inviting color and creature comforts go a long way. It's much easier to be engaged when working in a space that's aesthetically pleasing. No electronics during homework. If there's a TV in the room, turn it off and take the phone away. These can be distracting when trying to focus. Have rooms well lit and quiet. At the end of the day, it can be difficult to focus. Having a well lit room will help keep you alert as your body begins to wind down. A quiet environment also helps eliminate distractions. If you're looking for new design or remodel ideas for your living space, contact Lake Hallie Cabinets for a Free Design Consultation. We look forward to hearing from you!